Expedition Ships: To Convert Or To Build? There have been many changes in the field of expedition cruising in recent years. New ships were built, a few of them. Russian ships were chartered, a few more. And ships were converted, variously from small ships, coastal vessels and ice-class ferries. Last week’s announcement by Silversea that it was converting its Silver Cloud into an ice-class ship followed a move two years ago by Seabourn to ice-strengthen its own Seabourn Quest. Meanwhile, ship managers, naval architects and shipbuilders have come up with various proposals for new designs. First off the block, a few years ago now, was Sunstone Ships of Miami with its Project Unlimited, then STX France introduced its Ulysseas design this March and the Danish firm of Knut E Hansen followed with its own design just this month. This week we look at the two alternatives of converting or building. 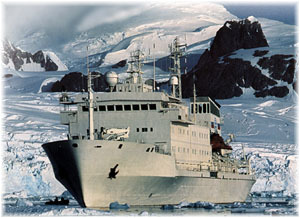 Modern expedition cruising could be said to have started when in addition to the few custom-built expedition ships that had already been built, the Russians came into the field in the early 1990s with the charter of what had been research ships to operators such as US-based Quark Expeditions and Canada-based Marine Expeditions. In addition to offering the 110-berth icebreaker Kapitan Khlebnikov the Russians produced modern Finnish-built research ships such as the 110-berth Akademik Ioffe and Akademik Sergey Vavilov, and a series of 52-berth Professor class sister ships. When Marine Expeditions ceased operating in 2001, the two Akademiks were taken over by Melbourne-based Peregrine Adventures, which in turn was acquired by UK-based First Choice (now TUI) in 2005. 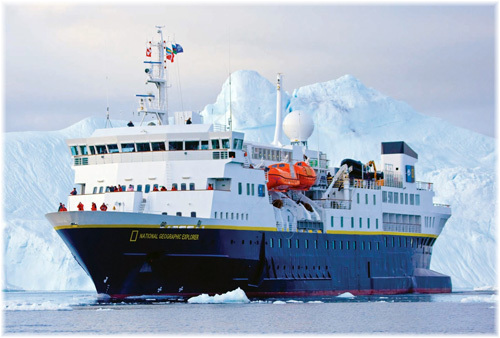 Today, this fine pair of ships is operated by British Columbia-based One Ocean Expeditions. Two newer Hurtigruten ships, the 500-berth Fram, built in 2007, and the existing 560-passenger Nordnorge, which had been built in 1997, also joined this sector. 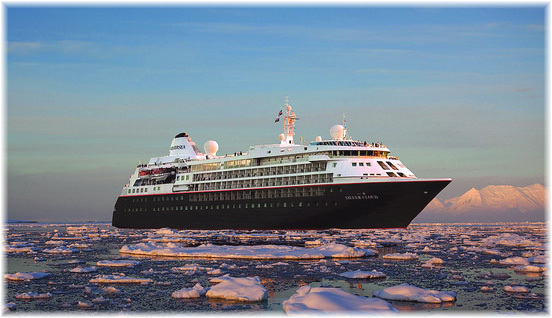 In 2008, Silversea introduced its 132-berth Prince Albert II, Lindblad Expeditions the 148-berth National Geographic Explorer, a conversion from a former Hurtigruten ship, and G Adventures, the 134-berth Expedition, another Scandinavian replacement to replace its own Explorer, lost in the Antarctic in November 2007. Last week’s news of the Silver Cloud being converted into an Ice Class expedition ship brings an interesting twist to the future. But the Silver Cloud is not the first of the ultra-luxury ships to be converted in this way. 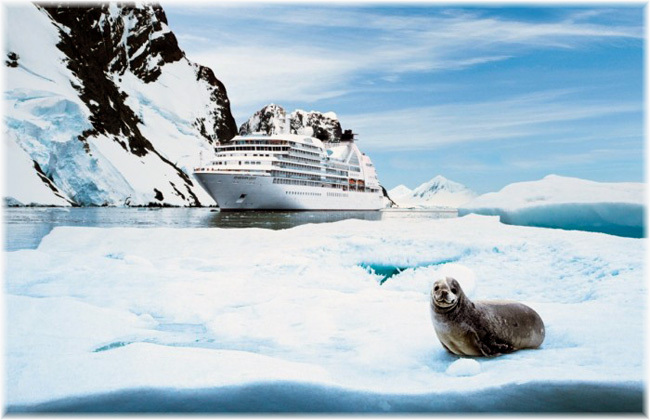 In a move that escaped many, the 2011-but 450-berth Seabourn Quest, was ice-strengthened in 2013, in time for the 2013/14 Antarctica season. Her Antarctic cruises consist primarily of longer 21 to 24-day cruises between Valparaiso and Buenos Aires that include five days in Antarctica with landings for up to 100 passengers at a time, the maximum allowed by the Antarctica Treaty. During her conversion, holding tanks were added to allow her to operate for up to five days in the pristine Antarctic without having to dispose of food waste. Heaters were installed on some of the outer decks, as was a changing station aft, where passengers can don boots and proper clothing to go ashore. This ship is equipped with 10 Zodiacs and tender platforms have been enhanced with ladders to allow guests to board Zodiacs easily and comfortably. The Zodiacs are equipped with AIS transponders. As an expedition ship, the smaller Silver Cloud will accommodate 260 guests. She will also sail on itineraries to non-polar regions, but when sailing in the Arctic and Antarctic, her guest complement will be restricted to 200. She will also be equipped with 18 Zodiacs. Between them, Seabourn Quest and Silver Cloud point to a new direction in the development of the expedition fleet for polar regions as these two ships have five more sister ships and the earlier Seabourn trio, now with Windstar Cruises, could be available for similar conversion. In fact, Star Legend, the former Seabourn Legend, already has a classification for ice. In all, these ships create a potential pool of up to a dozen potential conversions. Of course, the other way to expand is to build and efforts have also been made to produce offerings in this area. The first design was developed on the premise that over a period of ten years there had been a significant aging of the small oceangoing luxury expedition vessels (between 50 and 250 lower berths). 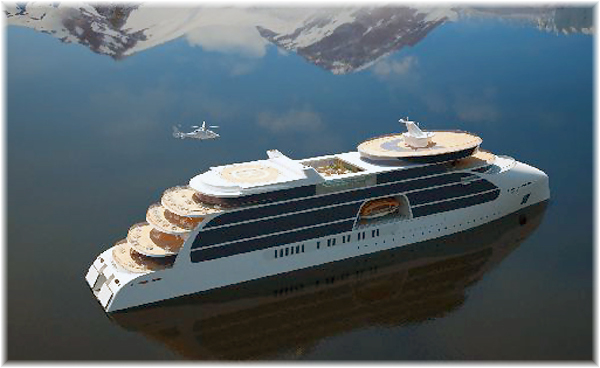 First conceived in 2007, the new building project features the development of a new luxury expedition cruise fleet capable of carrying up to 240 guests. At the same time, it seeks to set a new standard in expedition vessels, with all outside balcony suites, and an ice class of 1A. The highlight of the project is a proposed fleet of new Unlimited class vessels. These ships have been designed with a modern aesthetic, spacious public areas, and large cabins, all with outside balconies. The vessels have been designed for extended operation, and at 12.5-knots have a range of 10,000 nautical miles, or 33 days, and even at full speed, range is 6,550 nautical miles or 17 days at sea. Unlimited class vessels feature sonar, observation decks, and a water sports marina and equipment storage. For passenger comfort the vessel has been equipped with zero speed stabilizers that will ensure she is stable even at anchorage. They will also be equipped with dynamic positioning so that it can stay in position without having to anchor. Vessel exteriors would remain the same on all vessels in the class, but interior scheme selections range from 120 cabins (240 passengers) to 60 cabins (120 passengers), allowing for larger or smaller cabins as well as identical public areas more or less seating density. The initial proposal went out in 2008. Approximately twenty-eight shipyards submitted requests, estimates, and ideas, etc. for bidding on these vessels. From these shipyards the decision was made to select seven to nine that were believed to be able to build these vessels, but now a memorandum of understanding has been signed with one yard in Europe. During these meetings, it was determined that the new vessels must be built at a cost of no more than US$100 million. Environmental friendly, safe and sophisticated, Ulysseas is the new expedition ship concept designed by STX France, and was first revealed at Seatrade Miami this March. This new ship concept, produced STX France’s R&D department, will have a length of 475 feet long and beam of 59 feet, and will be able to host 200 passengers, and to access the most distant parts of the world. STX France has concentrated on defining a concept turned outwards so that passengers can enjoy the outside view at all times. Large glazed full-height windows will be installed in the cabins as well as in the public areas – restaurants, conference lounge, bars, spa and especially in the Observation Lounge. Wide-open decks will encourage contact with the environment. Passenger comfort has been thoroughly designed through four types of cabin, each being provided with an integrated balcony and a sea-facing bed and some of them with a Jacuzzi. The Spa and solarium and their sliding roof are also part of the relaxing offer while the ship is at sea. To fulfill owners’ expectation to widen the exploration offer, a huge number of facilities have been implemented: an inside embarkation zone allows the passengers to board safely rigid inflatable boats that are launched via an aft ramp. Additionally, the helicopter parked inside the “Helibar” is able to take off easily for another kind of exploration. While cruising in tropical waters, passengers can enjoy aquatic activities (kayak, jet-ski…) by using the aft marina. Ulysseas will take advantage of STX France’s Ecorizon R&D program and the ship will ensure a low environmental impact: no discharge at sea, maximum energy optimization and low emissions, largely underneath the regulation requirements. The vessel features four Zodiacs for exploring. An inside embarkation area allows passengers to board the Zodiacs that are then launched via an aft ramp. Knud E. Hansen, on the other hand, has designed a 300-passenger expedition vessel with green technologies. Designed to operate safely in heavy seas, high winds, narrow passages and small ports in regions such as the Arctic and Antarctic, the vessel will have a double hull that has been strengthened to Ice Class 1A and stabiliser fins to enhance passenger comfort. She will be powered by two Azipod propulsion units, two bow thrusters and a diesel-electric power plant, with four medium-speed diesel generators in two separate engine rooms. The engines can be used when the ship is sailing in areas with nitrogen oxide emission restrictions, while a battery-powered system will enable it to operate in extra-sensitive environments. The ship’s energy consumption levels will be reduced by engine heat recovery systems, innovative HVAC systems, advanced LED lighting and smart control systems, highly insulated windows and outside window walls with solar cells. Onboard facilities will include an observation lounge with 360-degree views, two top-deck Jacuzzis primarily heated by solar energy, a helideck and an enclosed glass aircraft hanger for the ship’s helicopter in the middle of the observation lounge. In addition, the vessel will have a remote operated vehicle with camera equipment so guests can watch high-definition videos of the underwater environment up to 10,000 feet below the ship. The videos will be displayed on big screens in the passenger lounges and also in cabins via the ship’s integrated video system. Situated across three decks, all 150 standard passenger cabins will have outside views, while those on the bridge deck feature balconies. Several of the cabins will also be able to be transformed into suites using a newly developed proprietary Flex Cabin system. Crew will be accommodated on two lower decks. At the aft of the ship will be a large sea garage and retractable overhead davit so 15 Zodiac type boats and jet-skis can be launched during shore excursions. There will also be a tender boarding station with a lobby, mud room and expedition store, which will be connected to the passenger accommodation by both elevator and stairway. Three designs produce three more choices. There will be plenty to play for as the adventure cruise market begins to merge with the expedition one.